The LAST photo of the Colosseum (I promise). Thanks to all of you who have left nice comments thus far in my vacation series. Yes, the weather was wonderful. In fact, Europe was having a bit of a heat wave. The average temp. for Rome in October is 71, according to most of the guide books, but we topped out at 80-83 the whole time we were there. The temperature ranges for the trip were supposed to be 45-71. That covered all the places were were going, so we packed heavy jackets, scarves and gloves, along with silk long underwear and camisoles. It turned out to be just so much junk we carted everywhere, as none of it was needed until the last day in Paris, which was in the low 50's to start out. I had no short sleeve shirts either, so folding up the sleeves and pushing them up all day was how I spent my time. That, and making sure my Passport was still safe in my neck pouch, and dispensing gum to mr. kenju and miss kenju (our daughter). Second photo: the doors of a temple, which is shown below. I wrote down that it was the Temple of Castor, but now I am not sure if this is it - or if the one below is (the one with only three columns standing). You cannot tell it from this photo, but the doors were at least 10' tall, maybe more. I was fascinated by the remaining bits of the temple in the last photo, for some reason. Above it, on the right side of the photo, is the Palatine Hill, where the emperors lived and all the wildest parties took place. We didn't go up there, but I hope to get back to it someday. Part of the reason I am confused about some of my photos is that when I loaded them into Picasa, they didn't remain in the same order as when I took them. I wish that hadn't happened! So, even though I took notes about what we had seen, I am unsure of some of them. Before long, I will take the cards to the photo shop and have the photos printed, and if they come out in the proper order, maybe I can make adjustments to the posts then. But if you have been there, and you know that I have named something wrongly, please tell me so I can make corrections. Everything looks like you had a wonderful vacation! Looks like you were very busy with your camera during the trip and used it to the max. Great photos of a remarkable place in history. These temple photos are facinating. Were they also plundered for building materials? These are some great photos and isn't it cool that its possible to get close to and insdie some of these great structures? I was in Verona a few weeks ago and we watched a great opera inside another colloseum. 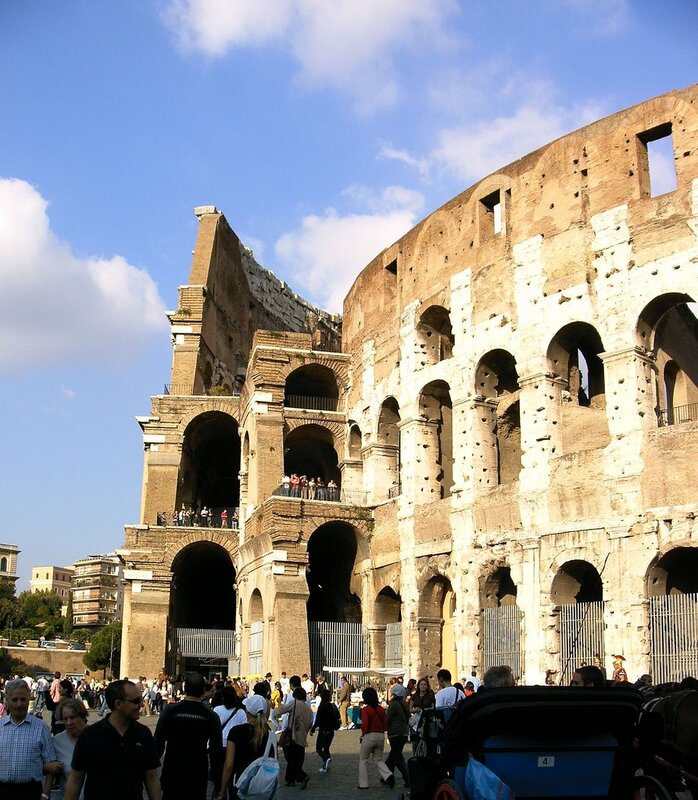 We were last in Rome in 1994, and your pictures (excellent, btw) have brought back SO many memories. Chief among them was our disgust that much of the marble from the colosseum was plundered to build the gaudy Victor Emmanuel monument built between 1885 and 1911 to honor Victor Emmanuel II, the first king of unified Italy. Other Roman ruins were also destroyed in the construction effort. BTW, I was wondering about the wheelchair from your title below? You might see if you can sort them in Picasa by date and time. That might put them back in order. God what gorgeous pictures. I'm glad you had such good weather and an amazing trip! Michele sent me...but I often visit on my own! I am so green with envy. Italy has topped my "wish list" for years. The pictures are fabulous! Thanks for taking us with you! Italy is on my "wish llst" of places to see. Your pictures are great. Also on my wish list. I've always wanted to go and your photos are giving me ideas! Were you part of a tour, or did you go with just the family? for those of us who hope to go someday, what would you have done differently? Wonderful photos, wonderful place. 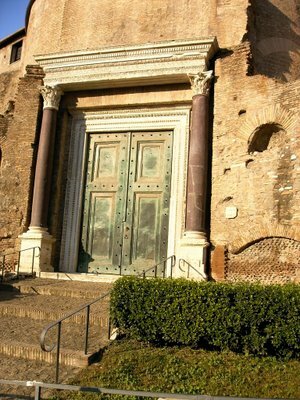 When I was in Rome, repairs were being made to the Coliseum, and we were not allowed to enter. Great travelogue, Judy! To Rome! So Rome was the mystery! Do you know Tabor from One Day at a Time (on my blog list)? She just got home from Italy! The one with the six columns looks curious, because it has a cross on it. 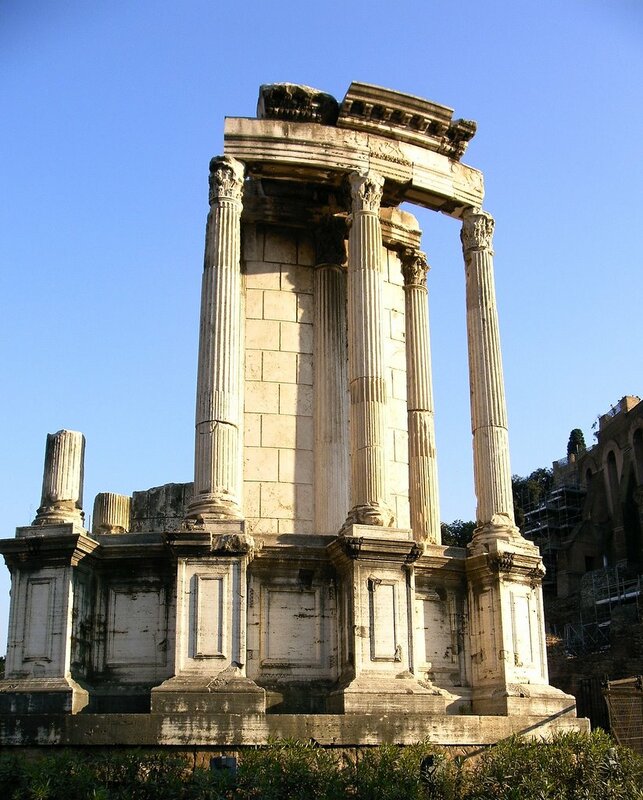 The ancient Romans didn't go for crosses, unless they built them to kill folks! 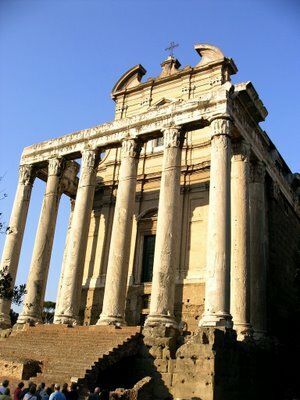 It is the Church of San Lorenzo, 17th century, built on the ruins of the Temple of Antonius and Faustina.